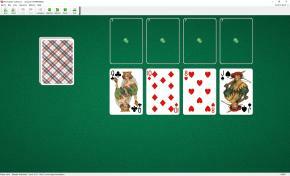 Amazons Solitaire uses one stripped deck (24 cards). 2, 3,4,5 and 6, King and Ace of each suit is removed from the deck. You have 4 tableau piles and 4 foundations. One card is dealt to each tableau pile at the start of the game. Sevens are moved to the foundations as they become available. You can only move a card from a tableau pile to a foundation directly above it. You cannot move cards from one tableau pile to another. When you have made all the moves initially available, click on the stock pile to deal one card onto each tableau pile. When a foundation is finished, no cards are dealt from the stock pile to the tableau pile below this foundation. Amazons Solitaire is one of the solitaire card games included into the BVS Solitaire Collection.